One of the most decorated and revered players in the sport, Beau Kittredge is one of the best players in the game. 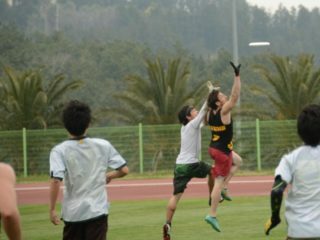 Hailing from Fairbanks, Alaska, Beau first honed his game with Mamabird at the University of Colorado before joining club teams Denver Johnny Bravo and San Francisco Revolver. All told, Beau has won five world and three club titles. By day, he's a children's book writer. Beau is embarking on a four-year adventure after receiving an offer he couldn't refuse. After a 14-year career, Beau realizes that the dream of pro ultimate isn't worth pursuing unless it includes everyone. E.R.I.C. is going on tour to spread ultimate and cancer awareness in cities all over the USA. Recovering from an ACL, MCL, and meniscus tear to become a world champion was one of the most trying experiences of Beau's life. Beau swallows his pride and welcomes a new teammate to the Dallas Roughnecks. Beau didn't become a champion overnight. He worked hard, and failed. And failed some more. Beau shares his thoughts on the importance of Spirit of the Game. Beau is joining the Dallas Roughnecks, and he's bringing a friend. Beau has some exciting endeavors planned in the coming year, including news that will undoubtedly change the narrative of the 2016 AUDL season. Down 8-5 in a Nationals elimination game against Truck Stop, Beau plunges into an abyss of pressure and self-doubt.